Abstract. The Southern Ocean is known to be the largest high-nutrient, low-chlorophyll (HNLC) region of the global ocean due to iron limitation. However, a large phytoplankton bloom develops annually downstream of the Kerguelen Islands, a bloom which is sustained partly by iron released from the sediments deposited onto the shelves. In the framework of the KEOPS-2 project, we used radium isotopes (224Ra, T1/2 = 3.66 d; 223Ra, T1/2 = 11.4 d; 228Ra, T1/2 = 5.75 yr) to provide information on the origin of iron fertilization and on the timescales of the transfer of sediment-derived inputs (including iron and other micronutrients) towards offshore waters. Significant 224Ra and 223Ra activities were found in the near vicinity of the Kerguelen Islands, in agreement with the short half-lives of these isotopes. Significant 224Ra and 223Ra activities were also detected up to 200 km downstream of the islands and more unexpectedly in offshore waters south of the polar front. These observations thus clearly indicate (i) that the sediment-derived inputs are rapidly transferred towards offshore waters (on timescales on the order of several days up to several weeks) and (ii) that the polar front is not a physical barrier for the chemical elements released from the sediments of the Kerguelen Plateau. 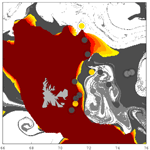 The Ra data set suggests that iron and other micronutrients released by the shelves of the Kerguelen Islands may contribute to fueling the phytoplankton bloom downstream of the islands, despite the presence of the polar front. However, the heterogeneous distribution of the 224Ra and 223Ra activities in surface waters suggests that this supply across the front is not a continuous process but rather a process that is highly variable in space and time. How to cite: Sanial, V., van Beek, P., Lansard, B., Souhaut, M., Kestenare, E., d'Ovidio, F., Zhou, M., and Blain, S.: Use of Ra isotopes to deduce rapid transfer of sediment-derived inputs off Kerguelen, Biogeosciences, 12, 1415-1430, https://doi.org/10.5194/bg-12-1415-2015, 2015. We investigated the origin and mechanisms of the natural iron fertilization that sustains a phytoplankton bloom downstream of the Kerguelen Islands. We used radium isotopes to trace the fate of shelf waters that may transport iron and other micronutrients towards offshore waters. 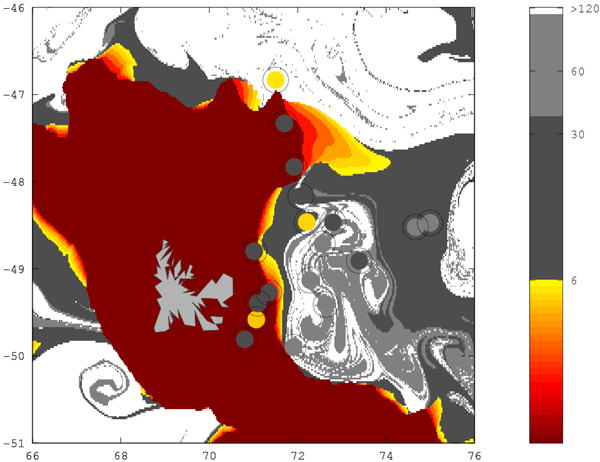 We show that shelf waters are rapidly transferred offshore and may be transported across the polar front (PF). The PF may thus not be a strong physical barrier for chemical elements released by the shelf sediments.